The Verbier High Five event (set-up and sponsored by Carlsberg) is a series of five pro-am races held one day at the end of the ski-racing season in the Swiss resort of Verbier. The event has the novelty that as well as current professional ski racers, some ex-pros also take part along with hundreds of amateur skiers, who compete with each other to try and get the opportunity to pair up with a profession in the finale - the slalom race. 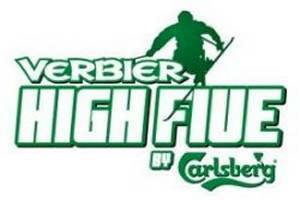 The Verbier High Five event, sponsored by Carlsberg, has been run since 1999 and has now established itself as a cult end-of-season party event for many of the professional ski racers from the FIS white circus. The event features five races - Giant slalom, Speed Monster, Big Bad Boarder Cross, Carlsberg Triathlon and then the Parallel slalom Pro-Am, which sees the best amateurs team up with pro's to make two-skier teams who then compete against each other. The races are all run on the same day and feature both pro-skiers and hundreds of amateurs. The fun aspect of the event has made it hugely popular with amateurs and pro's, who get to rub shoulders with each other during the event. It's a bit like the skiing equivalent of Lionel Messi, Cristiano Ronaldo, Wayne Rooney and Andres Iniesta having an end-of-season five-aside football tournament with a dozen pub teams. Danish brewery company Carlsberg started the High Five event back in 1999 and it has become a popular end-of-season competition, with it's light-hearted, relaxed atmosphere the perfect antidote to the rigours of the previous 5-6 months of non-stop FIS races. A number of professional skiers are invited to the event and they compete with each other in the first four events. Alongside this, there are nearly 400 amateurs battling it out as well. The best-placed amateurs after the first four events then get to pair up with the professional skiers in the parallel slalom. It's a great idea, with the pro's who accept the invite seemingly loving the opportunity to mix it with the amateurs and really get into the spirit of things. For a fun event, it attracts a surprising number of extremely high-profile racers, with slope legends such as Didier Cuche, Hermann Maier, Pirmin Zurbriggen, Luc Alphand, Lindsey Vonn and Aksel Lund Svindal all having appearing at it, some of them seem to love it so much that they now feature on an almost annual basis. The title for both men and women is awarded after the fourth event - the Carlsberg Triathlon. The final event, the Parallel Slalom, sees pro's pair up with amateurs in teams to race each other. Which amateurs get to race with the pro's depends on who has finished highest after the first four events. 800m long giant slalom course. Skiers speed recorded 120m after the start. Whoever's going the fastest gets the points ! A good event for the amateurs to challenge the pro's. Obstacles and jumps on a 400m course, with 4 skiers at a time racing each other in skier/snowboarder-cross format. Three special 'after-ski activities', with the fastest time again taking the points. The final event. Pro's and top-ranking amateurs pair-up in teams and race each other, with the times of each pro and amateur skier being added up to give victory to the fastest pair. The 11th running of the Verbier High Five event saw Garmisch-Partenkirchen World Championships medallist Christof Innerhofer beat the previous year's High Five winner Didier Cuche into 2nd place. It was Innerhofer's first victory in the event, whilst for Swiss legend Cuche it was the third time he'd finished in 2nd place. In the women's event Frederica Brigonone of Italy and Sandrine Aubert of France tied for first place. It rounded off a great season for Brigonone in particular who had claimed the silver medal in the Giant Slalom at the World Championships in Garmisch. With 9 medallists from the Vancouver Winter Olympics accepting invites, the High Five Event had one of it's strongest professional fields to date. And with over 300 amateurs also fighting it out, the event was more popular than ever. Having finished in second place twice in the past at the Verbier High Five, Swiss World Cup Downhill winner Didier Cuche was ecstatic to finally claim the Carlsberg crown, seeing off strong competition from Olympic champions Aksel Lund Svindal of Norway and fellow Swiss Didier Defago. Double-silver medallist Tina Maze from Slovenia took the women's title for the second year running, rounding off a great season for her. Britain's Chemmy Alcott,a real fan of the event, claimed 2nd place. Detailed review of the Swiss ski resort of Verbier. Includes detail on the slopes, the town itself, all the links you need, and some useful local knowledge.